I have only been to a few conferences outside of Serbia and those were PHP conferences. Since I have been mostly working with Magento for the last three years, I wanted to give a Magento specific conference a try. The flight to Zurich from Belgrade lasts only one hour and forty minutes so I picked Meet Magento Switzerland. I arrived a day before which gave me some time to study the public transport of Zurich which is in my opinion very well organized and punctual. The conference was held at Riverside hotel in Zweiden which is a bit far from the Zurich centre so getting there involved changing multiple trains and buses. Luckily the public transport is so well organized so it wasn’t a problem. Riverside hotel is very modern and was a good choice for such conference. I arrived a bit earlier, so I had the chance to meet the Magento evangelist Ben Marks, who is a really nice guy. The conference began with Sylvain Raye giving us some useful information. Among other things this conference is the first Swiss Meet Magento conference. This talk was followed by the next one, which was also part of the keynote – Digital Transformation – Shaping a Marketplace 2.0 by Maurice Marzolf and Andri Mengiardi from Ricardo.ch Swiss website. Unfortunately this talk was in German language so I understood only a few words. One of the points was the fact that ecommerce is evolving fast these days and this was proved by a few charts. Seemed like a good and informative talk, it’s a pity I didn’t understand much. After this talk, the attendees were divided into two rooms – business room and developer room. 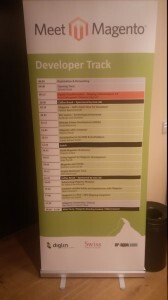 The business track seemed very interesting, I wouldn’t mind hearing those talks, but developer room got me more interested as it matches my job more. 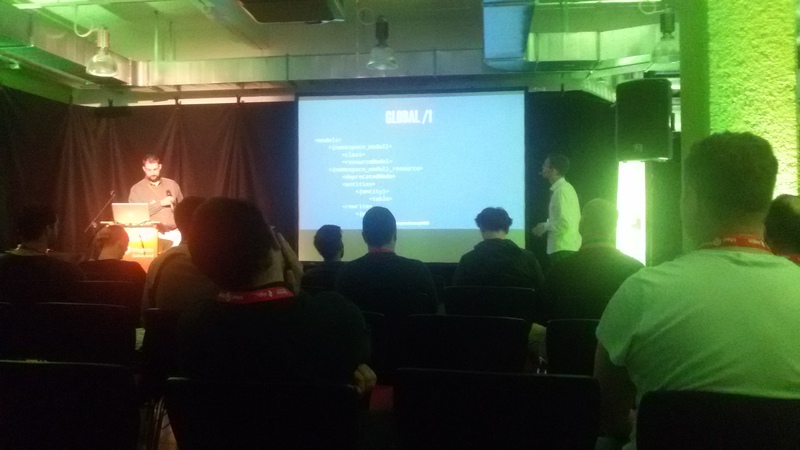 As I was chatting about the Paypal situation in Serbia with the guys from their booth I was a bit late for the first developer talk – Half a Rush-Hour for Developer which was held by Rico Neitzel and Fabian Blechschmidt who are very well known community members. Maybe because I was late I missed the aim of this talk. 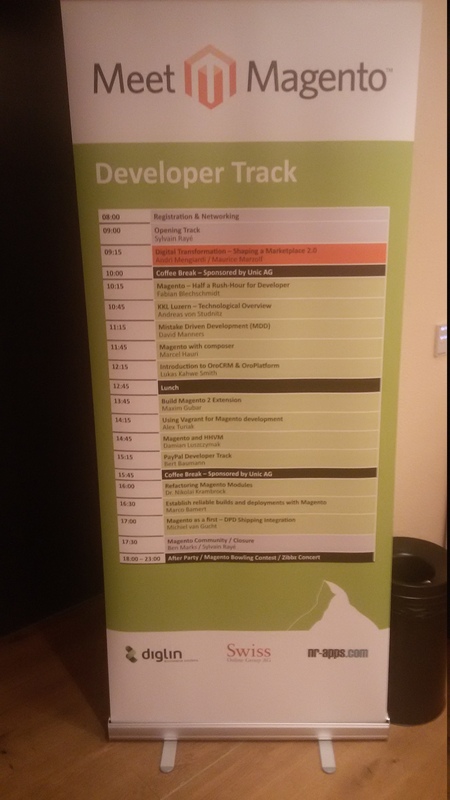 To me it looked like trying to say as many things as possible about Magento module development in 30 minutes which is obviously very hard to do. There were some things I was unaware of, such as that module declaration in etc/modules won’t accept uppercase TRUE or that even when the block is cached beforeHtml method will run. It came to me that maybe one point of this talk is that Magento can’t be comprehended in 30 minutes. The next one was Andreas Von Studnitz with a talk about KKL Luzern technology stack. KKL Luzern is a concert hall and on kkl-luzern.ch there is a shop where people can buy tickets for all kinds of culture related events. For this Andreas and his team made a Magento – TYPO3 integration. One of the interesting features is that was presented is that people can buy tickets in a 3D model of the hall so the customer can have the better idea of where the seat is. Andreas also gave us some tips, he said that a project can get complicated if too many companies are involved and that agile methodology should be used in development. Overall a nice talk but I think it was more for business people or managers than for developers. Next talk was held by David Manners and the talk was labeled Mistake Driven Development. It’s not a new development methodology but more of an entertaining talk where David managed to tell us some funny stories from his personal life in a form of advice that’s applicable to Magento development. Some well known rules were mentioned such as don’t reinvent the wheel and stay away from rewriting the core. It was a funny and refreshing talk. I was eager to hear the next talk as I have seen that some people are using Composer with Magento but did not have the chance to try it myself. Marcel Hauri went through some existing Composer implementations. He did set up a goal for him which was to effectively use Composer with Magento. There are a few implementations and at the end it seemed like it actually makes sense because using Modman extension files can be placed where they should be. The only non Magento talk was given by one of the Symfony community leaders Lukas Kahwe Smith and it was about OroCrm and OroPlatform. I was really interested in this one since I think that working on projects like OroCrm helps people learn more about Symfony2 itself. OroPlatform is an open source Business Application Platform basically which provides some useful functionality out of the box where OroCrm is a CRM application that’s built on top of OroPlatform. 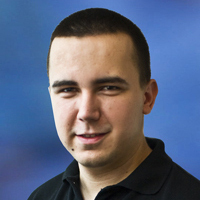 Lukas went through some basics of Symfony2 framework. Since OroCrm is lead by one of the original Magento creators Yoav Kutner, it makes sense that one of the first things that were developed was Magento integration. One feature that I found very appealing is the possibility for a customer to start the online shopping process, call the company to get some help and then the company person can finish the order for the customer. At the end Lukas called all of the attendees to get involved in development of this project. After the lunch break it was the time for a talk I anticipated very much Build Magento 2 Extension by Maksin Gubar, who has participated in the original Magento development. I did not dedicate much time to Magento2 and this was a good chance to catch up. One of the goals of Magento2 is to provide greater separation of concerns and more loose coupling. As some of you probably know there are no more code pools, config.xml is now separated into multiple files which are validated by XML Schemas, classes are being refactored. Magento2 will use Dependancy Injection pattern to provide loose coupling. Dependencies will be declared in an xml file and then injected via constructor. One feature that sounds great is a possibility to intercept methods. Apparently you could define a method which would get executed before or after an existing method which is a very useful feature in my opinion. I will have to explore some more and see how Magento team actually did this. Maksin also had live coding session during his talk which was very interesting. It seemed very easy to create a module and overwrite some specific method from Magento core. I expressed my concern that with Object Manager developers can easily get instance of any class in the system, completely bypassing the dependency injection. I thought it will be a way for people to write poor code quality extensions and Lukas Kahwe Smith suggested that community should check for Object Manager usage and flag those extensions as low quality. The next talk was about Vagrant. 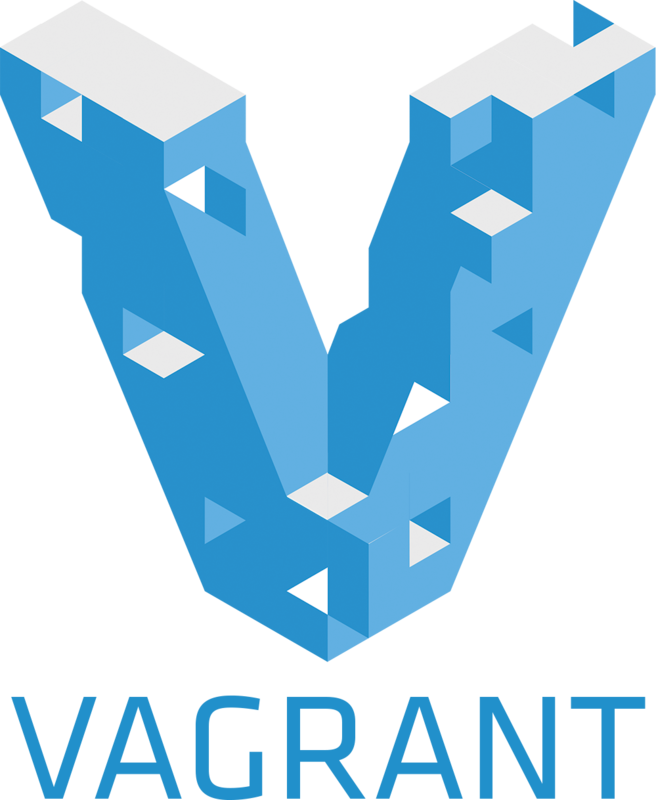 Alexander Turiak introduced everyone to Vagrant and explained how Vagrant can be useful in development. Some basic stuff was covered, but there was not much about Magento specific development with Vagrant, only N98 Magerun and Mage2 Vagrant were mentioned. An informative talk for those new to Vagrant. Damian Luszczymak had an interesting talk labeled Magento and HHVM. Whoever has followed PHP development these days has probably heard of HHVM, an alternative engine for PHP code. After a brief introduction to HHVM and some charts that prove that HHVM is actually a lot faster than native Zend Engine, Damian informed us that Daniel Sloof has made a significant effort to make Magento work under HHVM. Some of his patches were accepted by Facebook that created HHVM, so by helping Magento, Daniel was helping the entire PHP community, which is great. However, some third party modules may trigger errors. If I understood correctly, it is even possible to run some parts of Magento with HHVM, where it makes sense, such as indexing. There are even some cases where Magento with HHVM is being used in production and that was one very useful information. It was time for Paypal talk, Bert Bamann led us through setting up Paypal and explained express checkout in details. There was not anything coding related, so I think this was more of a business track talk. After the break Dr. Nikolai Krambrock talked about Refactoring Magento Modules. Basically it was a talk about how to fix stuff when somebody changed files in core or overwrote core files outside of modules. Nikolai gave some rules and a few hints on how to recognize poor quality modules. The next talk was about deployment. Marco Baumert talked about automating builds with Phing and the solution he came up with. I admit I was a bit tired for this talk which I would love to hear again. Sorry Marco. 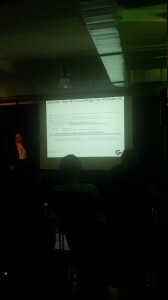 Next one was Michiel Van Gucht with Magento as a first – DPD Shipping Integration. I was too tired so I did not stay during this talk. Sorry Michiel I just hope I will get the chance to hear your talk another time. Magento evangelist Ben Marks closed the conference with his talk about Magento community. He explained us what his role is, which is basically making sure that everyone is happy in Magento ecosystem. He gave us an update on some issues such as Magento forums and Magento connect which should be fixed and improved soon. It was a good and motivational talk with a few funny moments. After this Sylvain closed the conference and invited us to a bowling competition which unfortunately I did not have time to attend. Overall I think it was a great conference, thanks Sylvain and Matthias and everyone who was involved for organizing this event. 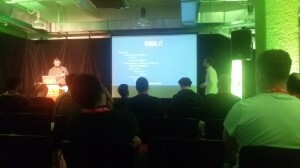 I would also like to give some positive criticism, I think that this kind of conference could use a centralized place for all the slides and perhaps coverage on Joind.in so speakers could get feedback. Apart from that, I think the conference was very well organized. Would you like to recommend this article to your friends or colleagues? This article was posted in category Conferences, Magento.